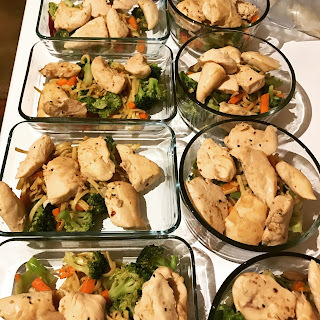 It's Monday, so lets talk meal prep! Lately, I have very much become obsessed with meal prepping. Because of our work schedules, and because it's healthier, Chris and I do things a little bit backwards. Since we don't have the opportunity to have even a single meal together Monday-Friday, we have our largest meals for breakfast and lunch. These meals get cooked on Sunday and stored in the fridge so we can grab and go. Dinner is always eggs for him, and either eggs or avocado for me, and we fix that once we get home every day. Since our dinners are super lite, that means I don't really cook during the week. I love love love not having to cook every night. It allows me so much time for other things that I would rather be doing. For a long time I've had a protein bar for breakfast. Only recently, did I realize that it had way more carbs than I should be eating, so I've reluctantly been trying to figure out better breakfast options. I did hard boiled eggs for a week, but it wasn't enough to get me to lunch, so for now we've landed on a breakfast sandwich. I know, bread isn't any better (its probably worse) than having all the carbs in a protein bar, but the sandwich is just so filling. I'm thinking about trying out smoothies next week, but this week its egg whites, one piece of bacon, and half a slice of gouda in a ciabatta bun. I make Chris' with sausage. When making these sandwiches, I crack twenty egg whites and ten yolks in a glass baking pan, season with fresh ground pepper and a little cayenne, and bake in the oven. (350 for 25-30 minutes) I also cook the bacon and sausage in the oven. I spray a cooling rack with a little olive oil and lay the meat on it. I place it on a bigger pan, one that has edges so the grease won't run off, and throw it in the oven. (375 for 20 minutes depending on desired crispiness.) When its all finished I'm able to cut the eggs in to perfect sized squares, top with meat and cheese and slide in that ciabatta roll. This whole process takes me an hour, and I'm finished for the week! Yay! I didn't take pictures of the process this week. Oops! I have been prepping this much longer. 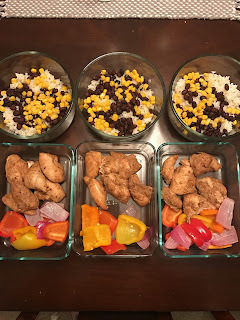 Right now we are rotating between a few things: dry spice rub chicken and mixed veggies, chicken fajita rice bowls, and teriyaki chicken and veggie stir fry. 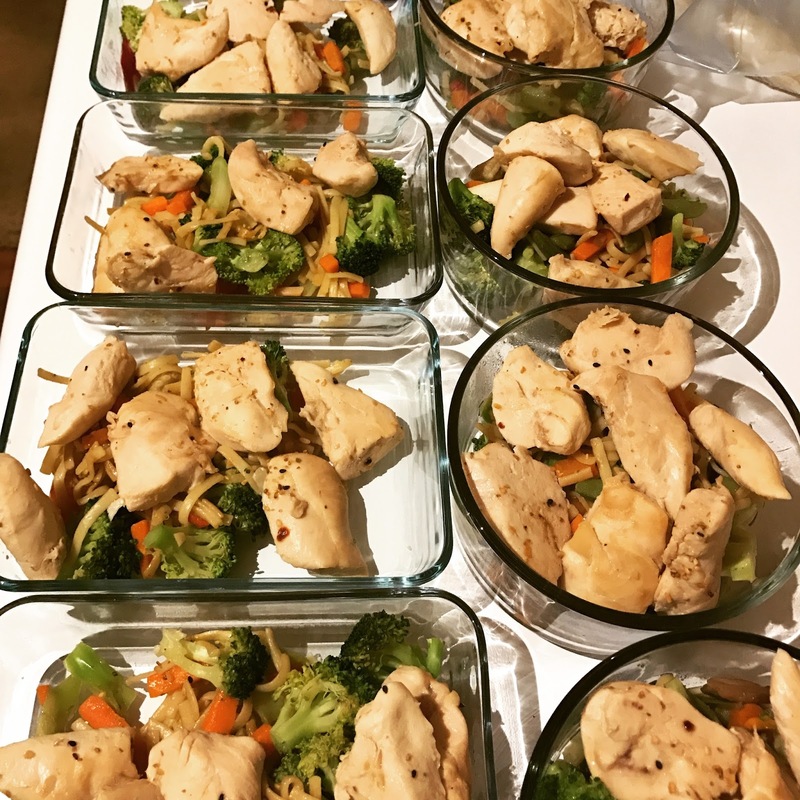 All of these have a double serving of vegetables, one serving of meat, and the rice bowls and stir fry have a very small serving of rice or noodle. We both love veggies, so that makes it a lot easier. The dry spice rub I just sort of came up with one day. I fill a plate or bowl with several spices. Usually cayenne, garlic, pepper, cumin, and a ginger asian spice or cajun mix. Really, any spices in your pantry will probably do. Cayenne is probably most important because of the many benefits it provides, but its spicy. I rinse the chicken breasts and coat both sides in the spice mixture and bake, just as you normally would. If I have time, I'll brine the chicken first. It makes it much more juicy. For the vegetables, I cut up broccoli, squash, zucchini, bell peppers, and onions, and roast in the oven at 400 for about 15 minutes. If you roast too long they get mushy, and since they will already have to be microwaved before eating during the week, I try to get them out of the oven a few minutes before I normally would. For chicken fajita rice bowls, I marinate the chicken in fajita seasoning for as long as possible, and then bake. In a separate pan I bake onions and peppers. I prepare a bed of rice, black beans, and corn, and top it with the fajita chicken and peppers. Since rice takes a little longer to warm up, I store these in two separate containers. Teriyaki chicken stir fry is probably the easiest. I get the huge bag of stir fry veggies and throw it all in the skillet with some teriyaki and soy sauce. I put the same sauce on the chicken and bake it, then throw it together. Also, I always get extra broccoli to throw in, just because broccoli is our favorite vegetable, and because we love extra veggies! Yum! Lastly, snacks! There is very little prep involved in this part, just dividing everything up into containers. Our snacks are apples and peanut butter, grapes, nuts, and cheese. I absolutely love meal prepping, for so many reasons. Three hours of work on Sunday morning, and everything is cooked for the whole week. I love not having to cook every night, I can do so many other things instead. I also love that everything is ready for me to grab and go. Bonus! I do dishes once a week now! We're trying really hard to eat healthy and prepping helps so much! Do you meal prep? 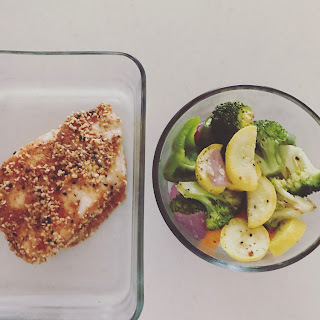 I'd love to hear healthy recipes from others!